This may be a bold statement but this is LITERALLY the best thing since sliced bread. Especially if you enjoy your sliced bread toasted with a little bit of butter. If you’re like me then the only thing stopping you from enjoying buttered toast every morning is the fear of developing type 2 diabetes the fact that cutting the butter is so damn annoying. 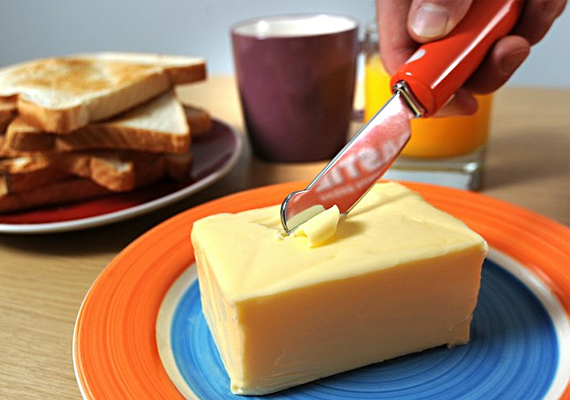 But this new butter knife by British baker Warburtons cuts through a stick of butter like a hot knife… because you know, it IS a hot knife. The Toastie Knife runs on AA batteries and contains heating elements that keep it at a constant 41.8 degrees Celsius. If you are toasting the bread, stick your regular butter knife on top of the toaster.